Unleash the power of your computer to make it a photo player with 256 transition effects and your preferred background music. View your photos on screen with the information when and where the photos were taken. 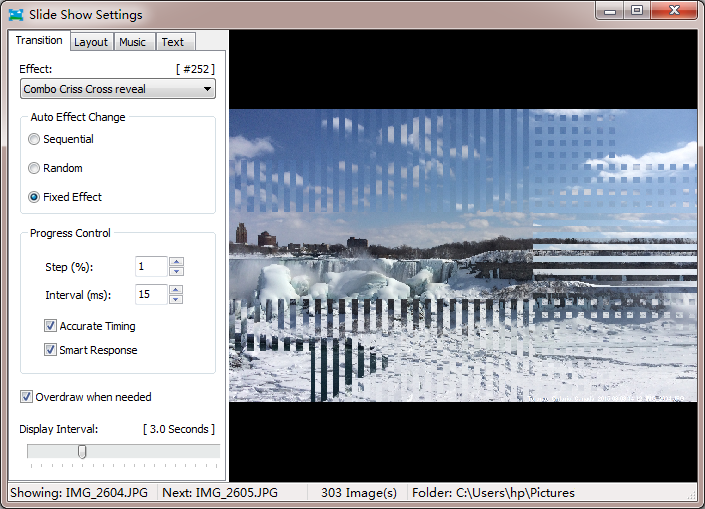 Simply point to the folder of the photos, and enjoy a dynamic slideshow with 256 transition effects, which can be random, fixed, or sequential. It\'s up to you to decide how fast your photos are displayed in the slideshow, and how your photos are fit to screen. You can create your customized playlist to play only your preferred songs as the background music. Create collections, datestamp automatically, lossless crop, rotate, resize, rename, view EXIF, view with snap stamping, "red eye" removal - all these and many other options for processing your digital photos are available with SnapTouch.